kW Volts W/in2 No. Htg. * Add the suffix “3P” to the model number for 3 phase power. Consult Section Z for data on allowable watt densities for viscous materials. †CAUTION: Explosion resistant type E2 construction refers to heater design features which provide explosion resisting containment of electrical wiring according to National Electric Code. Abnormal application or use of heaters which result in excessive temperatures can create hazardous conditions which can lead to fire. Not intended for use in hazardous areas. 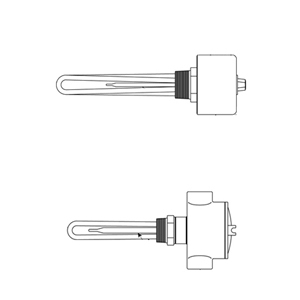 1 Heaters with General Purpose Enclosures are UL Listed with T1 or T2 Temps and CSA Certified with T1, T2 or T3 Temps. 2 Heaters with Moisture Resistant/Explosion Resistant Enclosures are CSA NRTL/C Certified with T1, T2 or T3 Temps.